I suspect this is going to be a pretty diverse What Are You Playing This Weekend? thread. It’s been a great couple of weeks for new releases: Hotline Miami 2, Helldivers, Cities: Skylines, Codename S.T.E.A.M., the continuation of Resident Evil: Revelations 2. There’s a little something for everybody (on top of the ever-growing backlogs we’re all sitting on). I wanted to talk about one buzzed-about new release in particular, though, and that’s Ori And The Blind Forest. I had intended on reviewing it this week, but there were…complications. (We’ll get to that.) Instead, I figured I’d give some thoughts here. It’s a gorgeous take on the Metroid formula. 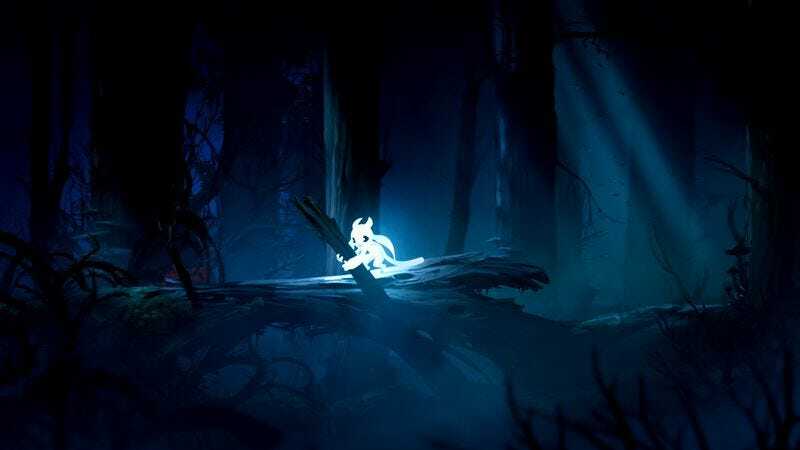 As Ori, a tiny glowing cat thing, you’re trying to revive a fantastical forest. Throughout the adventure, you’ll occasionally add to your arsenal of acrobatic maneuvers, learning how to reach new heights where previously inaccessible areas and doodads wait—and there are a ton of doodads. The most immediate draw, though, is the artwork. Every inch of the game (outside of some of the forest’s larger creatures) appears hand-drawn. The developers paid special attention to foregrounds and backgrounds, filling the game’s many planes with an energy that makes this place come to life. Never before has the cliché of saying something “is like playing an animated movie” been so accurate. It even has the matching orchestral soundtrack. Underneath that cuddly aesthetic is a surprisingly difficult game. This forest is made up of screen after screen of cleverly constructed death traps that require precise timing and reflexes. Ori’s true enemies are spike-covered walls and poisoned lakes. The countless murderous monsters, on the other hand, are either essential pieces of platforming puzzles or just annoyances to be dispatched by mindlessly mashing the attack button and launching your heat-seeking fireballs. Most of them fall into the latter category, which is Ori’s biggest flaw. There are too many things that you have to fight, and fighting them is tedium. The developers at Moon Studios came up with an innovative solution for mitigating the game’s difficulty. There are some save points scattered around the map, but you’re largely responsible for creating your own. Get the feeling the room you’re about to enter is going to be a doozy? Just hold down a button and make your own checkpoint, where you’ll resurrect moments after death. It softens the blow of potentially taking dozens of tries to master any given challenge. Here’s the thing: I like Ori And The Blind Forest—even with its tedious fights and often infuriating trial-and-error puzzles—but I don’t like it enough to play those six hours again. Had it been two or three hours, I’d be willing to consider it. But six? That’s a deal-breaker. And it’s just such a disheartening way to end your time with a game. It’s killed any desire I might have had to revisit it. Gameologerinos, has this sort of thing ever happened to you? Have you ran into something that crushed any hopes you had of finishing a game? I’d like to hear about those moments. Hopefully, none will come up in whatever you’re playing this weekend.